Artists, staff and faculty artists were invited to a potluck dinner on Valentine's Day at Tunnel Mountain Lodge at The Banff Centre. Each guest was asked to make a dish to with the 'power to woo'. Alana and I developed a "Woo scale". I created an edition of 30 prints illustrating the scale to determine the "amount of woo" in each dish. The scale was printed with blueberry pigment that contains anthocyanin, a pH sensitive pigment, which is present in plants and fruit. At the dinner, Alana Bartol performed the role of the diviner, taking a sample of each dish and placing it on a own print. I dowsed each sample to determine its power to woo. 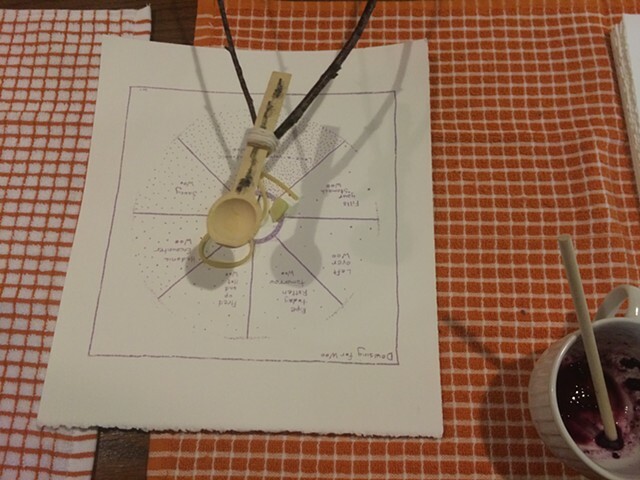 Each print was stamped where the dowsing rod landed, signed by the artists and given to the person who cooked the dish.